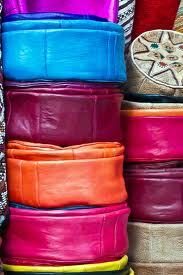 Chez Khayati leather shop is located into Marrakech´medina markets. Chez Khayati have an exclusive leather products collection . You´ll recognize Mustapha Khayati´s place two doors from Kullchi because the majority of his goods are on display outside his work-room/shop. Mr Khayati is a master leather-worker and his ingenious cushions, poufs, and babouches are proof of his talent. I recommend his small shop. Hand stitched by skilled artisans in Morocco, these three poufs are a vibrant, movable seating option in my home. Although poufs are available in a vast array of colors, I love the vivid hue of the pink and orange poufs I found while traveling in Fez and Marrakech. Hand dying and hand stitching of leather hides is a time-honored tradition in Morocco. The ancient dye pits are a popular destination in Fez; visitors can watch as leather hides are lowered into colorful dye vats, dried in the open air, and crafted into poufs and babouches (traditional leather slippers). In Marrakech, I was introduced to a master leather craftsman named Mustapha Khayati. A colorful, hand stitched collection of poufs and babouches fill his small shop. Mustapha Khayati is often found outside the shop stitching his fine leather goods in the open air. Poufs purchased in Morocco are unfilled in order to allow for easy transport. The poufs are filled at home with everything from newspapers to fabric remnants. I have filled the pink and orange poufs with old t-shirts; the poufs have become a time capsule filled with reminders of concerts, events, and clothing my daughter has outgrown. Many fashion bloggers are fans .